He Gets to Drive the Firetruck! Having lost his dad at the age of seven, Roger became close to his uncle, who became like a father to him. Uncle Johnny, a career firefighter with Arlington County, took Roger with him to the firehouse on many occasions. He got “hooked” and has never let go. As soon as he was old enough, which at the time was twelve years old, Roger began volunteering at Haymarket Volunteer Fire Department in June 1977. (The current minimum age is 16.) He couldn’t ride the emergency equipment, but he could hang out and ride with the Chief. He met the current Little Fork Chief, Doug Monaco, during this time at Haymarket. He stayed on for the next ten years, making it to the driver’s level on all apparatus, and loving every minute. A year before he graduated from high school Roger began taking the test for career fire departments. He had no idea what a challenge this would turn out to be! Even with his years of experience as a volunteer, he had difficulty getting into a career position. For a number of years he made a living driving a dump truck. Later, after receiving his ASE Mechanic’s Certification, he worked at Rick Hunt Ford as a technician. In 1987 a move to Fauquier County brought about the change to volunteering at New Baltimore VFD. While there he rose from Chief Mechanic, to Lieutenant, and finally to Captain, where he remained until he moved out of the area in 1996. With a schedule of 48 hours on and 72 hours off, Roger found himself with some free time. Having moved to Culpeper County, and knowing everyone at Little Fork, he naturally got involved, joining as a volunteer in 2007. It did not take long for this experienced firefighter to move up the ranks. 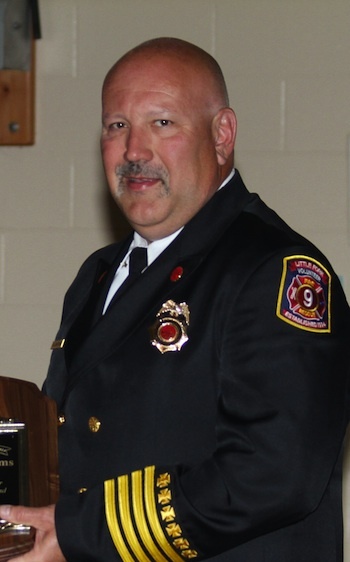 He was appointed as Lieutenant in 2008, Assistant Fire Chief in 2012, and Deputy Fire Chief in 2014. He donates 20-25 hours a week serving his community. He has been one of the top ten call runners for the past five years, running about 150 calls each year. It takes a special person to be the wife of a career/volunteer firefighter. Roger’s wife, Lisa said, “I knew he was never going to give it up, so I made up my mind to get involved.” She became the treasurer at Little Fork so that they could spend more time together. Their son, Austin, now 19, is a volunteer firefighter at Little Fork as well. Roger’s favorite part of the job at Little Fork is driving the fire truck, something he does not get to do at his career job because he is always riding in the Chief’s vehicle. In the Chief’s absence he is in charge of any major incident, such as a house fire or brush fire. As part of Roger’s role at Little Fork, he runs the training program for new volunteers. He attends many of the county meetings with Chief Monaco, staying abreast of what is going on in the county. He runs annual inspections of all equipment, assists the Chief with the ordering of new fire equipment, and helps manage a team of 65 -70 volunteers. In planning for retirement, Roger and his wife have started a trucking company, Double L Trucking Company, LLC. They are beginning with the one dump truck they already own, with plans to expand in a few years. He will begin hauling rock five days a week, and devoting evenings and weekends to Little Fork.